What to know: Dominican has won the last five matches between the current NACC rivals, including a reverse sweep on Feb. 15 in River Forest, Illinois. The two schools played in the MVCL before their schools’ primary conference, the NACC, started to sponsor men’s volleyball in 2018. Dominican is in fourth place in the conference at 4-2, two matches behind first-place Benedictine. Two of Dominican’s non-conf losses this season were against NCAA Division I-II schools – Lewis and Concordia-Irvine. The Stars have lost their last six matches – all away from home, and as a result dropped in the coaches poll from a high of No. 3 a couple of weeks ago. In addition, Dominican is posting a 7-0 record at home, while 1-6 on the road. Milwaukee Engineering has won their last three matches after losing three of their previous four matches. The Red Raiders have bounced from receiving votes to being as high as No. 13 in the coaches poll. Milwaukee Engineering is in second place in the NACC, just a half match out of first place. Just like Dominican, Milwaukee Engineering is perfect at home, posting a 5-0 mark. The one area where Dominican is statistically better than Milwaukee Engineering is in the blocking game, where it rank fifth nationally at a 2.37 blocks game average . In their Feb. 15 match, the Stars out-blocked the Red Raiders, 18 to 6. The Stars are the better defensive team across the board as they rank 20th in both digs per game average and opponent attack percentage. The Red Raiders will look to use their service superiority to secure a victory. Milwaukee Engineering averages 1.99 aces per game, which is good for 19th in the nation. Dominican senior middle attack Adam Eboli’s 1.28 blocks per average game ranks third nationally, while he ranks seventh in the conference with a .280 attack percentage. His 11 kills versus Milwaukee Engineering in the match on Feb. 15 was a season-best, while his .529 attack percentage was his second-best mark this season. Milwaukee Engineering setter Quin Krisik is one of three players in the nation to have recorded a triple-double this season. Krisik leads the Red Raiders averaging 0.64 aces per game and 8.29 assists per game; Milwaukee Engineering leads the conference as a team in both statistical categories. He ranks second on the team in digs per game average and attack percentage and third in blocks per game average and kills per game average. What to know: Benedictine Mesa will attempt to extend its program-record 11-match winning streak as it travels to the West Coast for a two-match conference series against UC Merced. 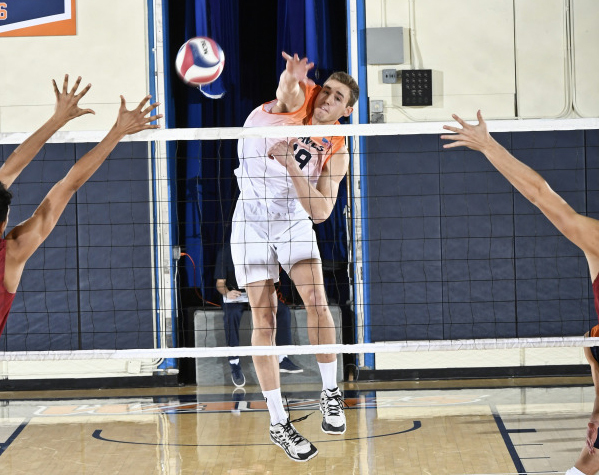 This winning streak has already featured a home sweep against UC Merced — along with victories versus Charleston, a NCAA Division I-II opponent, and UC Santa Cruz, a NCAA Division III team. The Redhawks are third in the NAIA with a 2.40 blocks per game average. UC Merced is in the top 10 of the NAIA hitting .251 but was held to a .126 attack percentage in its loss to Benedictine Mesa earlier this season. The Bobcats have won five of their last six matches, including upset victories against UC Santa Cruz and Dominican on Monday. In addition, UC Merced is attempting to beat Benedictine Mesa for the first time in its program history.Benedictine setter Jaron Jones is fifth in the NAIA with a 10.2 assists per game average and in the team’s most recent match surpassed the 3,000 career assists milestone. He had 35 assists and guided the Redhawks to a .375 attack percentage in their sweep against the Bobcats earlier this season. UC Merced libero Zach Brill is fourth in the country with 164 digs. He also has double-digit digs in six matches, including a season-high 18 digs in a victory against Dominican on Monday.